Galbraith is handling the sale of Lochridgehills Farm by Dunlop in East Ayrshire, an attractive livestock and amenity unit with over 90 acres of productive farmland and offering significant potential for development. 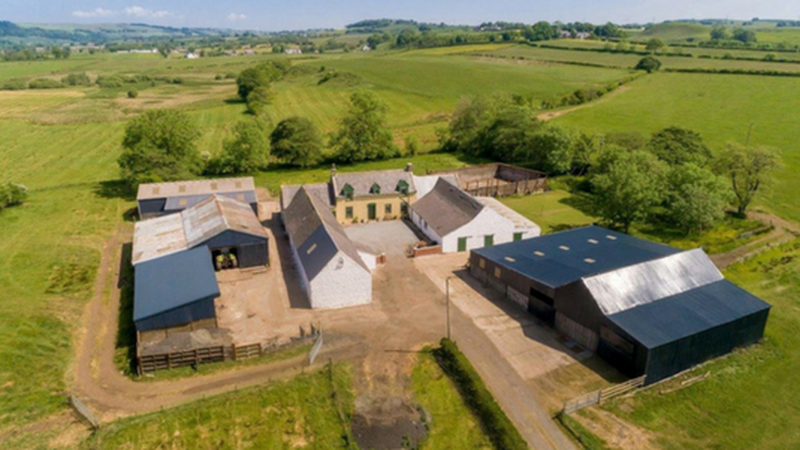 Lochridgehills Farm is a compact former dairy unit, equipped with an extensive range of modern and traditional buildings which are now utilized for sheep and housing a beef herd. The farmland comprises 36.53 Ha (90.27 acres) of productive grade 4.2 pasture and silage ground. The land is largely down to pasture, some permanent pasture and some areas which have been cut for silage in recent years. There are several small blocks of amenity woodland throughout the holding. The charming farmhouse would make a spacious family home. Dating back to the 1800s and built from original stone under a slate roof, this is a traditional property set within a south facing U-shaped courtyard. With three bedrooms and two reception rooms, the farmhouse provides ample space for family life and entertaining. The property includes a range of traditional and modern farm buildings. These include several cattle and machinery sheds, a byre, former dairy buildings, a former bothy, calving pens, a workshop, barn, garage and stores. Some of these buildings could be adapted to expand the agricultural business or may offer potential for conversion to other commercial or residential use, subject to the necessary planning consents. The sale of Lochridgehills offers an ideal opportunity for the right person to continue running it as a working farm or to consider further development of the buildings for use as an alternative business or expand into other rural business opportunities. The modern and traditional buildings offer scope for development in a number of ways. The property is situated in a scenic area and is easily accessible to Dunlop, Kilmarnock and Troon. This is a relatively compact landholding which makes it a manageable size for a new owner to run and potentially expand. Lochridgehills Farm is within two miles from the popular village of Dunlop, and just 22 miles from Glasgow. Dunlop, with its excellent primary school and railway station with regular services to Glasgow, make the village an idyllic place to life. The surrounding area of Ayrshire is perfect for those who enjoy the pleasures of the outdoors, with the famous golf courses of Turnberry and Royal Troon in close proximity. There are also great yachting facilities at the nearby marinas in Troon, Largs, Inverkip and Ardrossan. In the last 12 months, more than 100 farms and blocks of farmland totalling over 15,000 acres, with a value in excess of £100 million, were marketed by Galbraith in Scotland. The firm offers the most comprehensive network of Agricultural Mortgage Corporation agents in the country, who can help to secure agricultural and rural business loans through the AMC. Many Galbraith agents also run their own farms, providing first-hand experience of the business. The Galbraith farm sales team in Stirling is complemented by planning consultants, building surveyors and agribusiness specialists. Galbraith frequently handles sensitive sales off market. Lochridgehills Farm is for sale through Galbraith for offers over £520,000.